A Horsham, Pennsylvania, couple is seeking approximately $1 million in damages from the Navy over PFC contamination of their property. These dangerous chemicals, including perfluorooctane sulfonate (PFOS) and perfluorooctanoic acid (PFOA), were continuously discharged onto their property for years, depriving them of its value. Since 1994, the couple owned the property located near the former Willow Grove Naval Air Station. Firefighting foam containing PFOS and PFOA was used in training drills at the base and purportedly contaminated the areas surrounding the base including property owned by private residents. 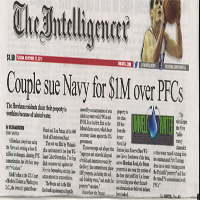 The Pennsylvania environmental lawyers at Williams Cuker Berezofsky filed a lawsuit against the Navy in the US Court of Federal Claims in Washington, DC, stating that the couple’s property was contaminated. They seek compensation for inverse condemnation, which means that the government took private property but did not compensate the owner as required by the Fifth Amendment of the Constitution. The suit further states that hazardous waste, disposed of by the Navy, contaminated the property, including the soil and drinking water. The suit alleges that the Navy water runoff, originating from the Fire Training Area, was channeled into a swale that ran across the couple’s property. According to investigations, the drinking water in their private well contains over 15 times the Environmental Protection Agency’s limit of parts per trillion of dangerous PFOS and PFOA.